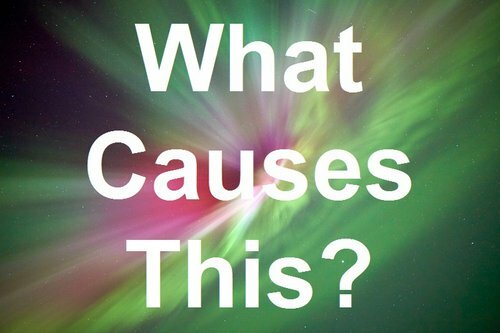 What causes the Aurora Borealis. What really causes the Aurora Borealis? A million miles-an-hour Earth-Sun handshake. Do other Planets get them? The Aurora Borealis (“Northern Lights”) or their southern counterpart the Aurora Australis are spectacularly colorful night-time displays, located above the Earth’s magnetic poles in the northern and southern hemispheres. Auroral displays can exhibit many colors, the most common being green or red and are caused by the influence the Sun has on the Earth. These magnificent lights can be quite dynamic and can appear as scattered clouds, streamers, curtains or arcs that dance before your eyes. But what causes these dazzling displays? A continuous stream of energetic particles from the Sun, known as the solar wind, are carried out into space along magnetic field lines and interact with the gaseous particles in the Earth’s upper atmosphere. Not only do these energetic particles cause beautiful auroral displays but also hazardous space weather conditions including power grid outages, communication blackouts, damage to spacecraft electronics and astronaut health. Luckily for us, the Earth is protected by its own magnetic field, the magnetosphere, and most of these energetic particles are deflected. The magnetosphere is very similar to that of a bar magnet, however it is teardrop shaped as it is compressed by the solar wind on the dayside. When solar particles manage to penetrate the Earth’s magnetic shield they are accelerated down the magnetic field lines to the poles where they collide with gaseous particles in the Earth’s atmosphere. The most magnificent displays are caused when the Sun is particularly active. Sunspots are regions of highly concentrated magnetic field, thousands of times that of the Earth’s magnetic field, that appear dark as these regions are cooler than the surrounding solar surface. They usually appear in pairs and are responsible for the largest-scale eruptive phenomenon in the solar system, coronal mass ejections. These eruptions are huge bubbles of plasma threaded with magnetic field that are launched into space at speeds up to several million miles an hour and when earth directed can cause huge geomagnetic storms. Coronal mass ejections occur more frequently during the maximum of the solar cycle. This is the Sun’s 11-year activity cycle and is defined by the number of sunspots present on the solar surface. The more active the Sun is the more sunspots there are on its surface, and as a consequence auroral displays are more frequent and spectacular. 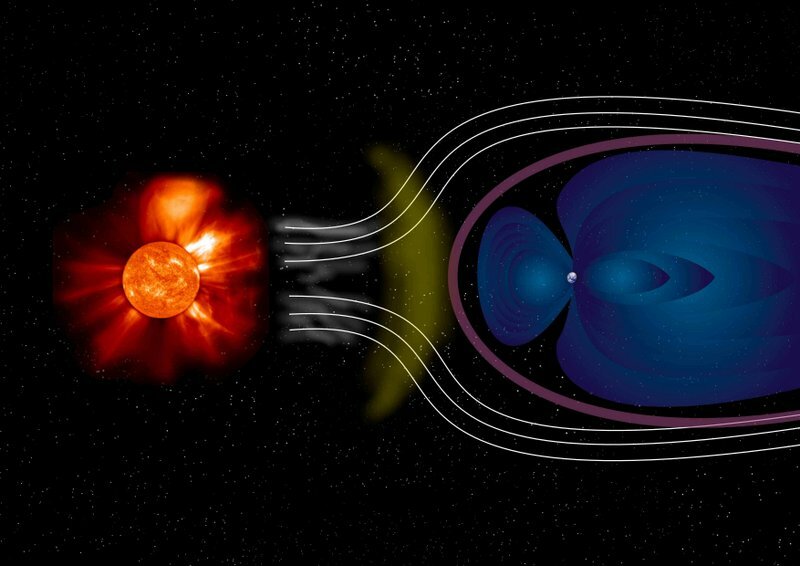 When a fast stream of solar wind or a coronal mass ejection arrives at Earth and buffets the magnetosphere, if the orientation of the magnetic field within this structure is southward directed then it will interact strongly with the Earth's magnetic field. This interaction involves the Earth's magnetic field being peeled open almost like an onion to allow the energetic particles to enter the magnetosphere and become trapped. The field that has peeled away builds up on the night-side until it eventually snaps like a rubber band allowing particles to be accelerated down the magnetic field lines towards the poles, entering the Earth's atmosphere, causing the aurora. What causes the different colors? The color of the aurora is dependent upon the wavelength of the emitted light. It is similar to a fluorescent lamp where the color depends upon which gas in the atmosphere is involved and what state the molecules are in. 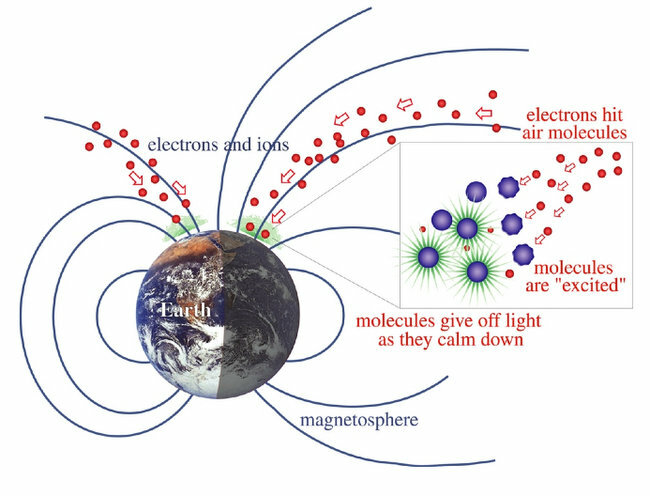 When solar energetic particles enter the Earth's atmosphere and collide with atmospheric atoms and ions, their outer electrons are promoted to higher energy levels and they become excited. When the electrons eventually relax and return to their original energy levels, light is emitted at a certain wavelength which is dependent upon the transition. Depending upon which molecule is involved this will correspond to a certain color in the visible part of the electromagnetic spectrum. The most common color exhibited by the aurora is green, which is due to oxygen molecules. Red light is caused by collisions with oxygen and nitrogen molecules, whilst blue and purple light is also due to nitrogen. You can learn more about atmospheric altitude and auroral light and about how different atoms produce the various colors. Do other Planets experience them? 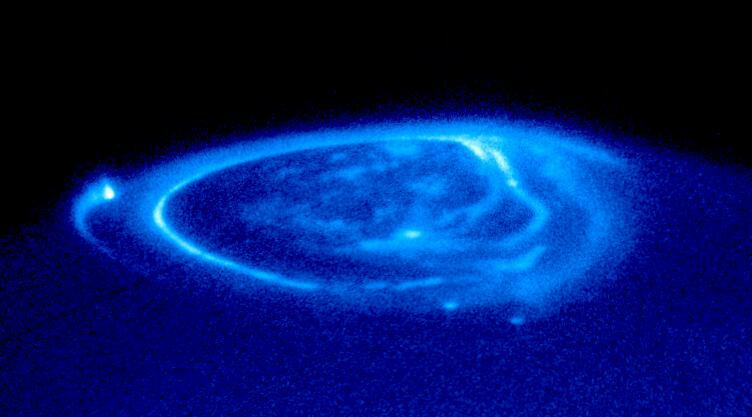 Yes, we’re not the only planet in the solar system to experience these impressive displays as the Sun’s influence extends to the outer solar system with auroras also observed on the gas giants Jupiter, Saturn, Uranus and Neptune. The process behind these auroras are the same as on the Earth with gases in the upper atmosphere being excited by energetic particles streaming in near the magnetic poles. Most of these particles originate from the solar wind, however for Jupiter, some of them come from Jupiter’s closest moons Io, Ganymede and Europa. The aurora is observed in both hemispheres in an irregularly shaped oval ring around the Earth’s geomagnetic poles, known as the “auroral oval”, which is usually located around 67 degrees when activity is low. However, as geomagnetic activity increases the auroral oval becomes disturbed, expanding towards the equator and spectacular auroral displays can be observed at mid to low latitudes. Some of the best places to visit to view the aurora are in Northern America, either Alaska or Canada, and Norway, Finland and Iceland in Europe. Although, the Northern Lights are always present the best time to view them is on clear nights during the winter months, nominally September, October, February and March as this offers the most hours of darkness and lower levels of light pollution. Sightings of the Northern Lights are possible at any time, although during solar maximum is best as sunspot activity and large eruptions are much more likely to cause the most impressive auroral shows. 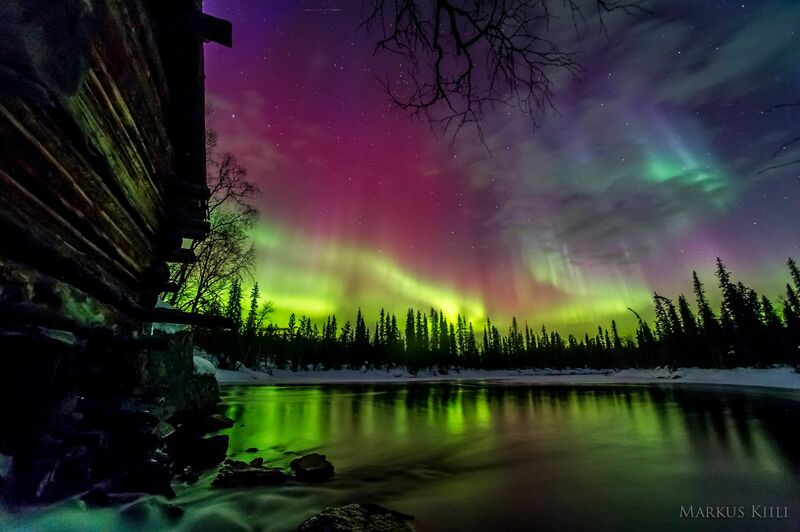 Seeing a beautiful Aurora can be an emotional and spiritual experience that often leaves a life-long impression. But what are the mechanics behind the transmission of this beauty from the outside world to where we can perceive it? Below you'll find an exceptionally interesting video explaining just that!